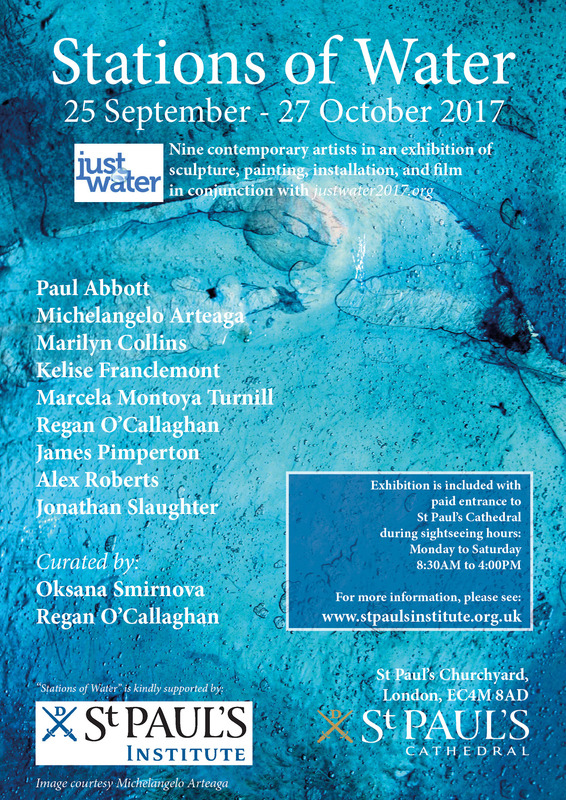 “Prayer for Rain“, an installation of copper, hologram, and sound is part of “Stations of Water” exhibition, with nine contemporary artists commissioned to create artworks, including sculpture, painting, installation, and film, in conjunction with justwater2017.org, at St. Paul’s Cathedral, London. From 25 September to 27 October 2017. 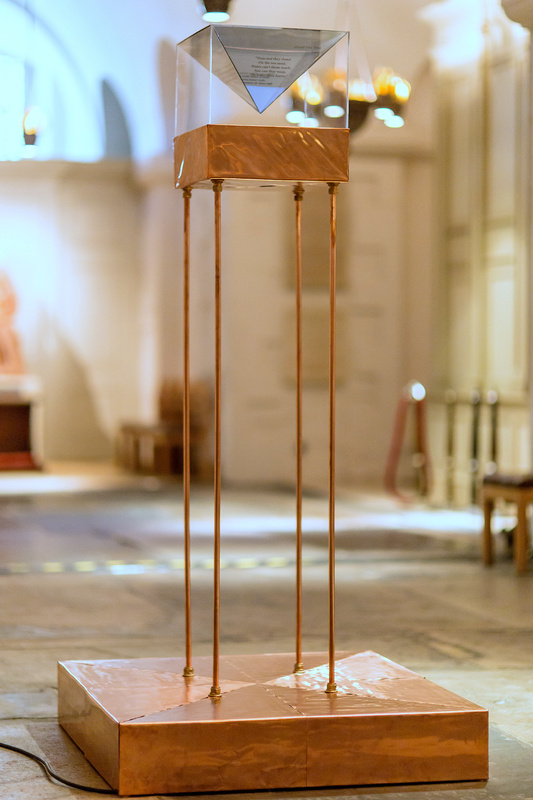 Kelise Franclemont, ‘Prayer for Rain’, 2017, hologram, copper, and sound, in ‘Stations of Water’ at St. Paul’s Cathedral, London. Image courtesy the artist. Photo credit Graham Lacdao. A single drop of water which seemingly emanates from the copper basin on the floor, travels up the pipes, to be released skywards one precious drop at a time. It is through faith that this drop becomes the carrier of hope, as it gently floats upwards in glittering repose, taking with it prayers within all of us, whether we are creatures of land or sea. Along with the simple act of faith in raising one’s gaze to the sky, actual “water prayers” from all over the world can be heard, beseeching whomever will listen, to revere this priceless life resource, seek rescue when we are overwhelmed, or beg relief from the peril when the rains won’t fall. Paul Abbott, Michelangelo Arteaga, Marilyn Collins, Kelise Franclemont, Marcela Montoya Turnill, Regan O’Callaghan, James Pimperton, Alex Roberts, and Jonathan Slaughter. Oksana Smirnova and Regan O’Callaghan. Special thanks are owed to voice-over artist Vicky Tessio (for sharing her lovely voice on the soundtrack by reciting two Catholic prayers in Spanish) and to author and director of Library for Gaza, Mosab Abu Toha (for sharing his poem “Dejected they stand…” which appears on the hologram prism). Posted in digital and multi-media, exhibitions, site-specificTagged interactive art, ritual, site-specific installation, storytelling in art, video artBookmark the permalink.